Triple Cascade Diamond Bracelet and Ring in 18K Gold – From the Cascade Collection at Kaufmann de Suisse Jewelers. The Dream Catcher Diamond Necklace – Capture the magic of your dreams with the Dream Catcher Diamond Necklace. A weaving diamond motif intertwines with white gold, promoting the flow of positive energy through its loops. Renew your mind, body and spirit with this alluring piece and surrender yourself to the power of rejuvenation. 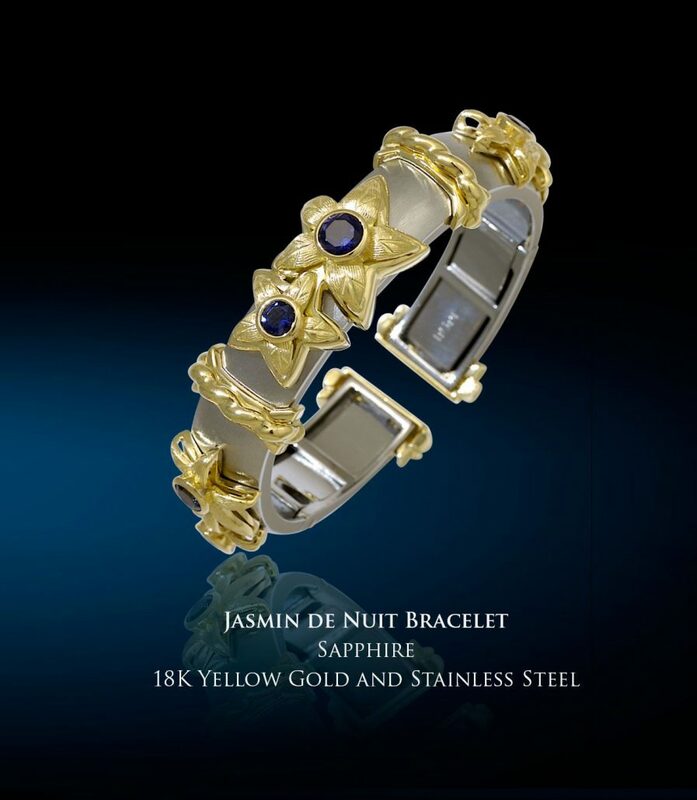 Jasmine de Nuit Bracelet in Sapphire and 18K Yellow Gold and Stainless Steel. An assortment of bracelets from the Callista Collection. Callista Bangles are original Kaufmann de Suisse designs. The Apollo Diamond Necklace – In ancient Greece, the Sun God Apollo symbolized youth and power. It is said he was one of the most beautiful of the Greek gods, with golden hair that looked like fire. The Apollo Diamond Necklace takes its inspirations from the legend. Featuring 56 diamonds that radiate luxury, this necklace bestows the strength of the feminine, and the influence of the celestial. Double Flowing Lines Citrine Ring with 1 Citrine of 4.03 CTS set in Argentium Silver. 463.36 CT Tourmaline Necklace & 25.96 CTS Red Tourmaline Ring. Pictured with a Peridot & Diamond Ring. Hera’s Mirror – Queen of the Greek gods, Hera was a powerful deity who held her beauty and esteem in the highest regard. Legends say she had a mirror that could see the future. Inspired from this myth, Hera’s Mirror Pendant expresses a revered dignity and nobility that will suffuse you with divine beauty. Triple Cascade Ring – 18 G/VS Diamonds 4.50 TCW 18K White Gold. This shopping cart from Kaufmann De Suisse has been shared with you.